Since NTS Bishkek’s UtroLive! went out… um, live…. I didn’t immediately have a link to my erudite comments about Kyrgzystan’s first ever historical epic film, Kurmanjan Datka, but from what the movie’s producer Farkhad Bekmambetov tells me, who watched my 15 minutes of fame, I made sense, which is a relief. 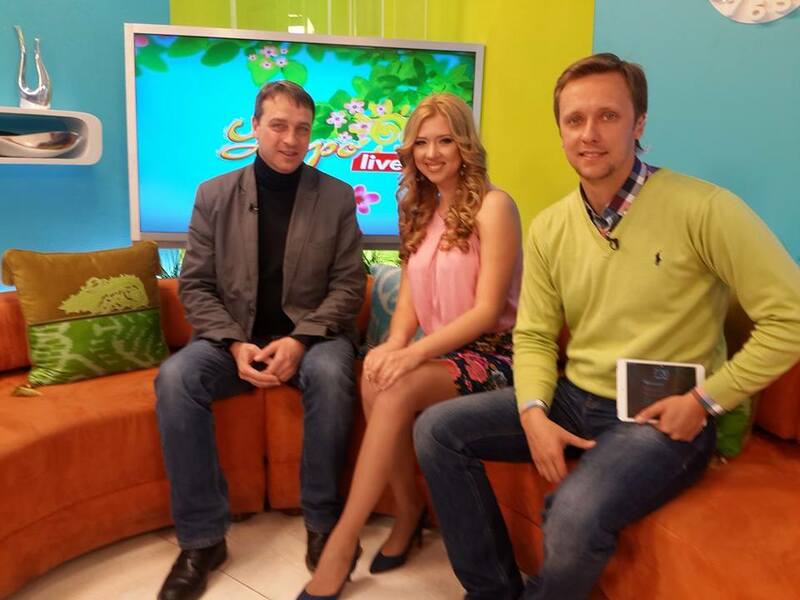 I do have a photo, courtesy of the Facebook site of the charming morning show presenter Nuraika (Nuraiyim Ryskulova) who had the presence of mind to ask as studio technician to snap a pic of us on the sofa when a music clip rolled at the end of our interview. 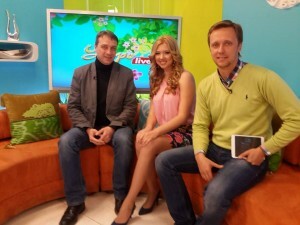 (and now: STOP PRESS, a link to the footage of..15 minutes of fame, Bishkek style…. The Ukrainian crisis has many ramifications: the arts, like truth, are among the first victims of conflict. The Odessa International Film Festival is seeking international support to ensure its 5th edition in the fabulous old port city of Odessa goes ahead…. Straying a little outside my usual Eastern approaches, but thinking of the recent ‘referendum’ in Crimea, this story from today’s Telegraph casts an intriguing historic light on the current debate over Scottish independence, due to go to a vote (north of the border) in September…. Ukraine: A glimmer of hope or a cynical agreement? Russia today seems to have stepped back from the brink over Ukraine; talks in Geneva have produced a surprise agreement on de-escalating the crisis. Of course, words need to be put into action. On the face of it, the agreement not only means that armed men in eastern cities like Donetsk need to leave their barricades and the buildings they occupy, but that Maidan’s defences in Kiev also need to be dismantled — a demand made by Yanukovych’s administration months ago that sparked the violence that precipitated his flight from Ukraine. Russia still has an agenda; what they means by federalism may be very different from what Kiev understands that to be. And things have come to such a pass that Ukraine needs to completely reinvent itself if it is to survive as a viable state. Tough choices remain to be made. This from a truly inspiring trip to Kaunas, Lithuania’s second city — which is actively promoting its wealth of locations to international film producers. For composer William Goldstein Monday’s visit to Kaunas to showcase the city’s benefits to filmmakers was an emotional experience.Mr Goldstein was among a group of a couple of dozen producers, directors and film guests of the festival’s industry sidebar “Meeting Point – Vilnius”, who were being shown the city by staff from the Kaunas Film Centre, which helps bring producers to the city. Mr Goldstein — Bill to his friends — is in Vilnius for a screening of Latvian director Maris Martinsons’ “OKI in the Middle of the Ocean” in which he appears alongside festival jury member, Japanese actress and director, Kaori Momoi. But he had Kaunus on his mind. “My grandfather was born here in 1874 and my great-grandfather in 1840,” said Bill who was raised in New Jersey, USA. The composer, who has more created scores for more than 50 film and television shows, including MGM’s 1980s series “Fame” and “Miracle Walker”, recorded 40 albums and in the Motown hall of fame under classical artists can be found between Michael Jackson and Marvin Gaye, was keen to do some research into his family tree. That proved a challenge: Jews livings in the Kovno Gubernias it was known under Russian rule until Lithuania gained independence in 1918, were not required to have surnames until 1804, making research beyond that date impossible. But for one of the world’s only practitioners of “instant composition” Bill was able to draw musical inspiration from the city and a beautiful local muse. Guests that included Ukrainian director and film school tutor Larysa Artiugina and director and screenwriter, (“White Shadow” screening in VIFF’s Critics’ Choice) Noaz Deshe, saw the city’s old town, mediaeval castle, Czarist era Fort No. 7, modernist cathedral, quaint funicular railway and other sites before a late lunch at the splendid Kaunas Garrsion Officers Club, built in 1937. There, Bill chanced upon a Steinway grand piano, made in London in 1936, and couldn’t resist testing its keys. After playing a short piece, Bill caught the eye of an innocent muse: festival industry coordinator Eva Brazdzionyte. “Give me three notes,” Bill said. Eva obliged and with those three notes Bill plunged into an absolutely original, instant composition, before an utterly spellbound audience. The name of that instant composition? Perhaps not as subtle as such classic April Fool’s Days stories as The Guardian’s 1977 island of San Serriffe, but this from today’s Daily Telegraph bought a smile to this cynical hack’s face….